Back in the sweltering summer of 2007, I got a bit crazy. I wanted to get across to people that becoming a better writer is not something a “10 Step” article can teach you. Yes, reading helps writers immensely, but when it comes down to it, you become a better writer by writing. Then, it occurred to me. Why not deliver that “10 Steps” post that everyone was hoping for as a way of hammering home the point? 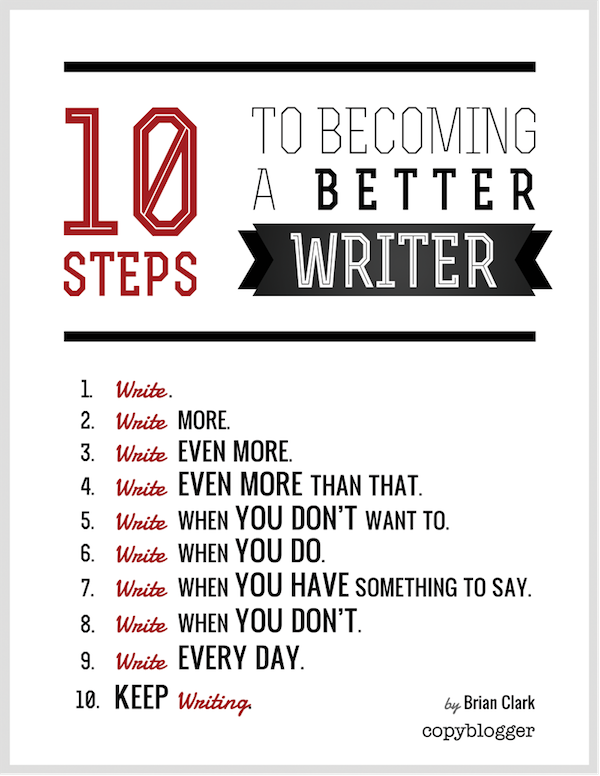 With that, the original 10 Steps to Becoming a Better Writer was born. It was an instant hit, and remains one of the most popular posts on Copyblogger. So, we decided to put it into a couple of additional formats. PDF Poster: You can now download the nicely-designed graphical version in PDF, suitable for hanging near your workspace when you need to see it most. Shareable Graphic: Or, if you’d prefer to publish the image on your own site, we’ve got another Copyblogger Shareable with handy embed code below. This is kinda like how you become a better swimmer, or guitar player, or video editor, or golfer, or designer, or dog trainer, or drummer. Do it and do it and do it. Great, simple, awesome poster! I’ve shared this post soo many times and it’s my favorite Copyblogger post. I will download it and hang it on my own wall and give the poster to a handful close friends! How about making one for for screensavers? That article is surely a hit on your website, and it seems appropriate to have an graphic for that. Amazing image and a well put way to show that visually. Awesome job, Brian.. Tried and true steps for becoming a better writer. Thanks for the reminder! Doesn’t fit perfect, but just set it as my desktop background, thanks! Okay, I’m going to put this onto my blog and see if it helps. Thanks! I’ve always loved this. Now I can share it with everyone! What timing. I just shared this post two days ago. I’ve now updated the post. Great work! Yep, I borrowed it and posted it to my blog. Thank you, Brian. I love the poster! Can’t wait to share it. Thanks! Thanks for the Poster. I’m definitely sharing! This a brilliant format for a brilliant post. I love it! It’s particularly poignant on those days when you have nothing to write about. Awesome! I used to have this list printed out and hung by my computer. Now I’ll have to print and hang this instead! But did you have to make it so complicated? Thank you. Your poster now has a home in my office! Ain’t cloning wonderful? I love your post Brian! I spent years looking for the “magic.” There is none – except writing. When people are asking for advice what to do to help their business, blog it is really that simple. When you write you get better on it, just keep writing. Heh, there is dirty details and with just writing it won’t make your business however, but if you push on quality you will definitely become more successful! As you keep researching and writing, your knowledge grows naturally! Interesting if you can share how did you came up with idea of this post making it that simple and not focus on any other details? Would be really curious about that behind the scens thinking process! Tweeted and shared between my followers as well! I love this poster. @ the age of 61, and owning an advertising agency, I feel as though I cannot write! How can this be? I have a professionl need to blog YET a passionate and deep desire to personally blog. I have so much to say it is bursting out of me! But, alas, I feel that I really have nothing of interest to say and that I’ll make a fool out of myself. 🙁 By subscribing to this terrific newletter i hope to catch glimpses of inspiration! Thanks for the excellent and FREE content. P.S. I will try to write, write and then write some more. Given the subject matter it would be rude to NOT write here and now. I’ll be putting that up on a wall right by my desk, thank you! I like it. Getting good at anything takes time and practice. As I’ve done more and more blogging I’ve found my writing improve. In another blog i follow the author wrote two posts a day for a month. His writing got better and better as the month progressed. Makes me want to try something similar. Your posts are one of the few things I look forward to receiving in my inbox – they’re always worth reading! So true. Blogging helps with that, too. You’re forced to write nearly everyday and the short posts hone your craft. Definitely one of my all time favorite posts here on Copyblogger! Love it! I’m posting it on my blog today. I get it. Practice makes perfect. Keep writing! Great infographic; I’d also also emphasize the importance of reading! For me, reading other people’s stuff is almost as important as practising my own craft, because it gives me ideas and keeps me up to date on current styles. Of course, pretty much everyone reads blogs and news articles these days. But I think it can be valuable to break open the occasional novel for ideas on how to spin sentences and weave words in ways that resonate with readers. All forms of communication are interconnected, and it’s good to see what’s going on in areas outside your specialty sometimes. Yes reading is that first step that could inspire oneself to be a better writer. I wonder do all of us have what it takes to be a writer? Well, we can give it a sincere try. Thanks for this straight forward infographic. You made my day. I try to write or at least read everyday. For some reason though my son doesn’t seem to want me to be a writer or a reader. Unless it is one of his books which he wants to turn the page after I read 2 or 3 words. This is brilliant! I can’t count the amount of times I’ve decided NOT to write because I just didn’t feel like it. – gotta get back to writing. I can’t embed the code :S It just shows the links but not the image. This is call On the Job Training! Ever had a moment when you wondered what to do? It’s the moment to do something that will move you forward to your goal. Maybe it’s just a minute or two or maybe a couple of hours. Do it. My mother, who taught college-level English composition for 30+ years, knew that the only way her students would get better was by writing all the time. As a result her students considered her the toughest prof in the English department! I came here thinking you were actually selling this poster. Darn it. Thanks Brian for letting your readers share this. Simple advice but still the best writing advice there is.Thanks! This is absolutely, positively the best writing advice ever. There are a lot of gimmicks, but this is the real thing. Just WRITE! Thanks for the super-cool poster! Love it. Will be referencing this in a new blog posts discussing quality of content over quantity and how loyal reader bases can make all the difference. Thanks Brian Clark for those awesome brilliant tips. Totally loved it, especially the number 8, 9, and 10. These are what i’ve been struggling to do everyday: “WRITE WHEN I DON’T WANT TO WRITE”. Thanks, i promise i’ll do those tips every day. I love number 7 — so many folks write when they have nothing of value to add. Wonderful visualization and constant reminder. I battled doubt for years and I wish something like this would have came into my life. Well done! i was hoping some daunting tips to follow to improve my writing, but that was something new. Awesome idea. write,write write is all we need to improve writing. thanks brian. Can’t wait for the sequel “20 steps to becoming a better writer” 🙂 All kidding aside… You are totally right. If you want to make it in this world you gotta produce something and then some. The guys that make it online either write a lot themselves or have someone else doing it for them. Well, I must say that the idea of this poster is unique and pretty much meaningful ! Just shared the poster on my facebook profile… Liked it..